A trip through the washing machine, some time with your vacuum cleaner and a bit of fresh air will all leave your pillows cleaner and fresher. The right cleaning method depends on what type of pillows you have. Whichever method you use, cleaning your pillow helps rid it of the sweat, dust mites and dry skin that build up over time, slowly turning your pillow into something you don't want to rest your head on. Clean pillows are healthy and free of bacteria. Pillows filled with feathers, down and fiberfill are all machine washable. Wash two together, or wash one pillow with towels to create a balanced load. If your machine has an agitator in the middle, stand a pillow on either side of it. Use the delicate cycle and cold water. Remember to check the pillows for any rips or tears before placing them in the washing machine. If you find any, skip the wash and opt for another cleaning method. After washing, place the pillows outside to dry, or put them in the dryer on low or no heat. 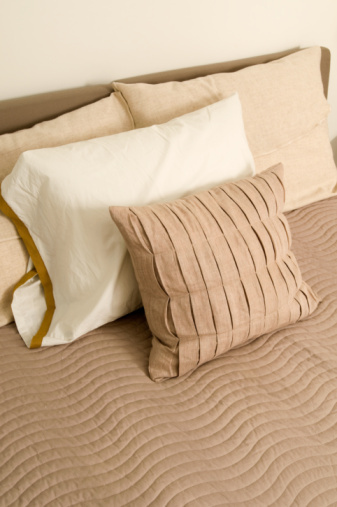 Leave ample drying time before bed, as dense pillows can take three hours or longer to dry completely. Throw a few tennis balls into the dryer with the pillows to fluff them as they dry. Always read the care tag on your pillow before cleaning it. When in doubt, avoid the washing machine. You can't toss memory foam pillows into the washing machine to clean them. The foam absorbs water like a sponge and holds onto it tenaciously. 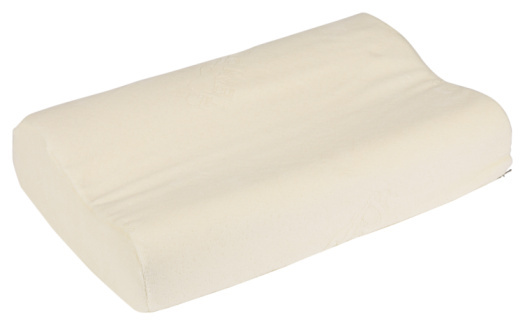 A wet memory foam pillow will form mold on the inside long before it dries. To clean one, put the upholstery cleaning attachment on your vacuum cleaner and vacuum both sides of the pillow. If you find stains on the pillow, remove them with a clean towel dampened with soapy water. Use as little water as possible to get the job done. When you're finished, place the pillow in the dryer for 20 minutes on the air-only cycle, or place it in the sun to dry. If you're able, lower the suction on your vacuum cleaner when vacuuming pillows. Less suction makes it easier to pull out dust and dirt without sucking the pillow's outer cover into the end of the vacuum. A healthy dose of fresh air works wonders to rid pillows of most odors. If your pillow smells funky, remove it from the pillowcase; sprinkle baking soda all over it, and place it in the sun for about three hours. If you can, prop the pillow up so as much of its surface area as possible is exposed to the sunlight and the air. Sunlight naturally kills many types of bacteria, and the baking soda will absorb the odors. When the odor is gone, brush or vacuum the baking soda off the pillow and enjoy the freshness. Now that you've cleaned your pillows, there are some tips you can use to keep them that way as long as possible. Buy an airtight pillow cover to keep dust and dirt from reaching the pillow at all. You can also place your pillow in two pillowcases at a time for an extra layer of protection. Fluff your pillow every day to keep it loose and shake out dust. Place your pillows in direct sunlight every time you wash the pillowcases for ongoing natural disinfection. No matter how diligent you are in your pillow care, you should wash your pillows every three to six months.